In this blog I’ll show you how to wash your clip-in hair extensions but first you need to make sure you choose the right clip-in extensions that will last you a long time. With so many different hair extensions in the market it is very hard to choose the right extensions for you. A lot of them can be very damaging and put a lot of stress on your hair. They are also very expensive and time consuming. That’s not the case with clip-in hair extensions. Not only do they add length and volume instantly but they are convenient and easy to apply. You can wear them whenever you need to go to a special event or just want to switch up your hair for the day. 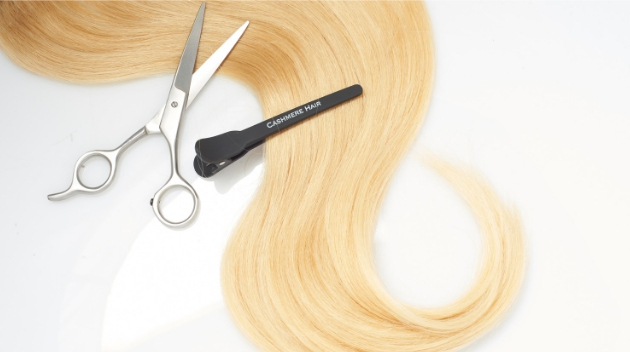 It’s important to purchase professional grade clip-in hair extensions which contain the highest quality of Remy hair. Remy Hair is the finest quality of human hair. When you buy Remy hair extensions you can expect them to last longer than other brands. The best feeling is when you first open your brand new set of clip-in hair extensions. They are absolutely beautiful, soft, shiny and what long hair dreams are made of. You put them on and are disappointed to see that they don’t really blend with your hair especially if you have short hair. That is why it is so important to take your new clip-in hair extensions to your hairstylist so he/she can trim them so they will blend perfectly. I don’t recommend doing this yourself since high quality clip-in extensions are not cheap and you don’t want to ruin them. I ruined my first set by cutting it myself that I lost a lot of the length. So now that your extensions are trimmed and ready for you to show them off to the world you want to make sure that before styling them you are using the right products specially designed for hair extensions. Always use a heat protectant spray before curling or straightening your extensions. The one I like to use is Cashmere Hair Extension Shine Spray. It softens and protects your extensions and prevents them from getting tangled. Even though Remy human hair extensions feel and look like our natural hair they require more maintenance than our hair. Our hair is constantly nourished through our scalp. That’ s not the case for clip-in hair extensions. In this case, it’s very important to wash them properly and use products that would help give them similar nourishment our real hair receives through our scalp. Make sure the products you use are Parabens, Sulfates and Sodium Chloride free. 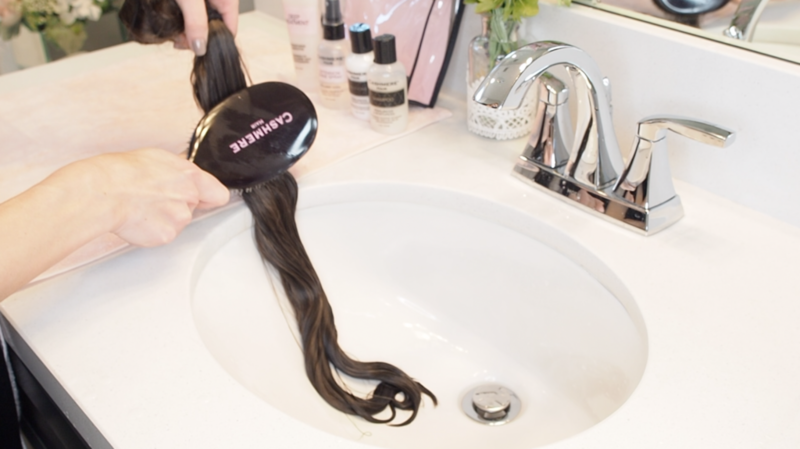 For most people it is not necessary to wash your extensions after every use. If you find that your extensions are tangling or frizzing up, please consider washing them and using a detangling spray after they have dried to smooth them and add extra shine. Washing your extensions will depend on the amount of products that you use. If you have a lot of build up products you might have to wash you hair extensions more often. If you have oily/scalp: Wash and Condition every 3-5 wears. After using hairspray or styling products: Wash and condition 1-2 wears. Dry hair/scalp: Wash & Condition 10-15 wear. Normal Hair / scalp: Wash & Condition 5-10 wears. If you swim with them (not recommended): Wash, condition and use a deep treatment immediately. To make things easier, you can watch this video tutorial or scroll down for step by step pictures which show you how to wash your hair extensions. 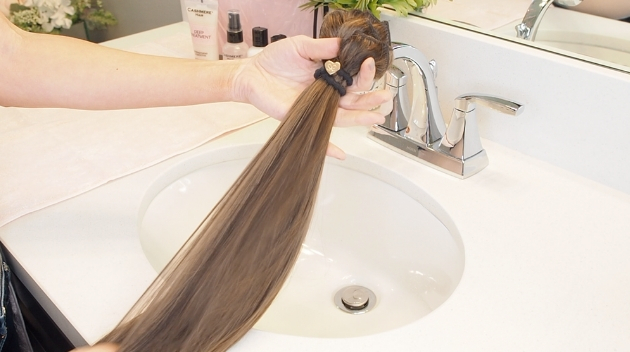 Remove clip-in hair extensions from your hair prior to washing. Extensions can be worn up to 15 wears without washing. Tie your hair extensions as you would tie your hair in a ponytail. Fill your sink with lukewarm water. Using soft or distilled water keeps the minerals off of your hair extensions. Gently immerse hair in water with shampoo until well saturated, work extra shampoo if needed. Wash with sulfate free shampoo or a formula made for hair extensions. I recommend using Cashmere Hair Extensions Shampoo. Rinse thoroughly in clean water and squeeze out excess water genlty. 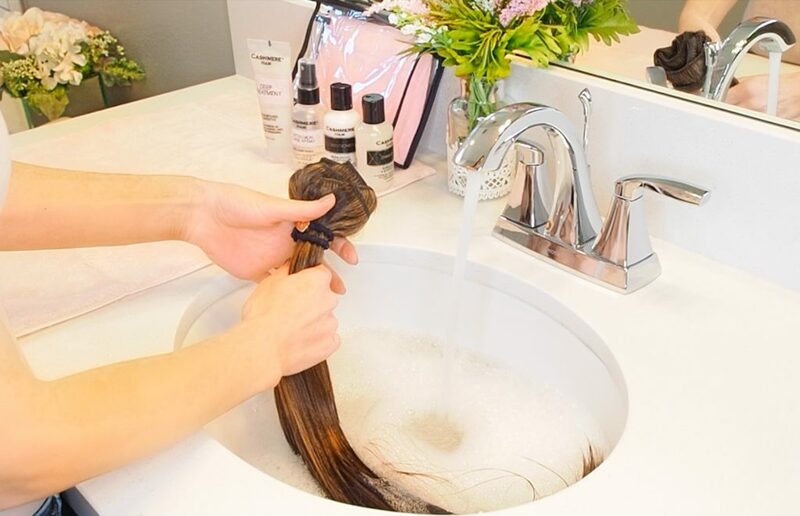 Fill sink with fresh water, and add your conditioner to hair working into hair with fingers. Immerse hair into water, and work conditioner into hair while gently finger combing out tangles while under water. Rinse thoroughly with clean water. Squeeze out excess water gently. Next, follow with a deep treatment. 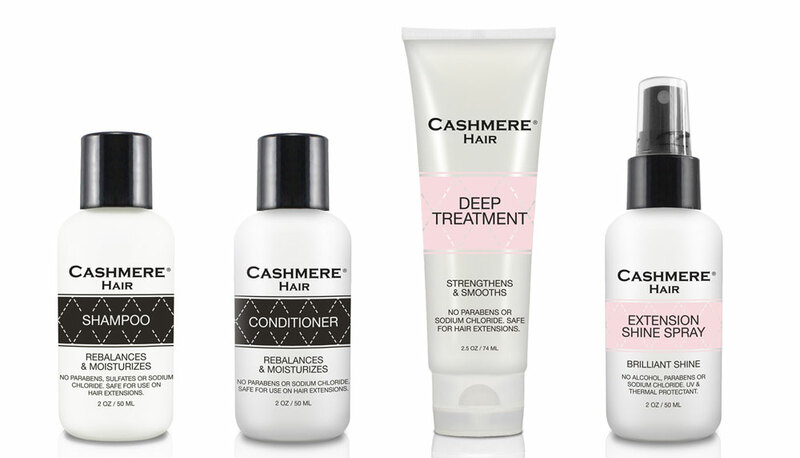 I recommend using Cashmere Hair Strengthening & Soothing Deep Treatment. 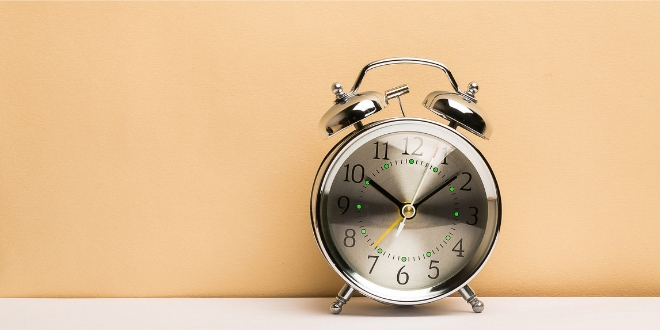 Leave on for 5 minutes and rinse with clean water. With a boar bristle brush start brushing your hair extensions to detangle the hair starting from the bottom ends in small sections and working your way up to the top. Towel blot your hair extensions to remove excess water and and lay flat on a towel. Do not rub your hair with the towel, this may cause frizzing or damage. 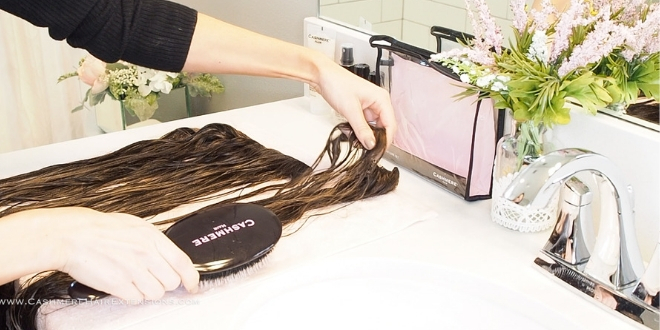 Lastly, brush each track of your hair extensions and lay them flat on a towel to dry. Air drying is the best method to prolong the life of your hair extensions. You can blow dry them on a low heat setting and style them with a flat iron or curling iron. Are you guilty of not washing your hair extensions? Hope you found this tutorial helpful. Please leave a comment below and feel free to ask any questions you may have.